Yep, it will be an all-SEC Regional Final as the teams meet in Kansas City this afternoon with a spot in Minneapolis on the line. It will be the team’s 3rd meeting of the year and the Cats won both of the previous games, 82-80 in Auburn on January 19th and 80-53 in Lexington on February 23rd. The winner will take on Virginia Saturday night. Auburn will have to do this without Chuma Okeke, who tore his ACL on Friday night against North Carolina. There’s absolutely no question this is a devastating loss but Auburn responded after Chuma’s injury and was able to win it for Chuma. As it has been all season long, it’s been a next man up mentality and Auburn will need other guys to step up today. 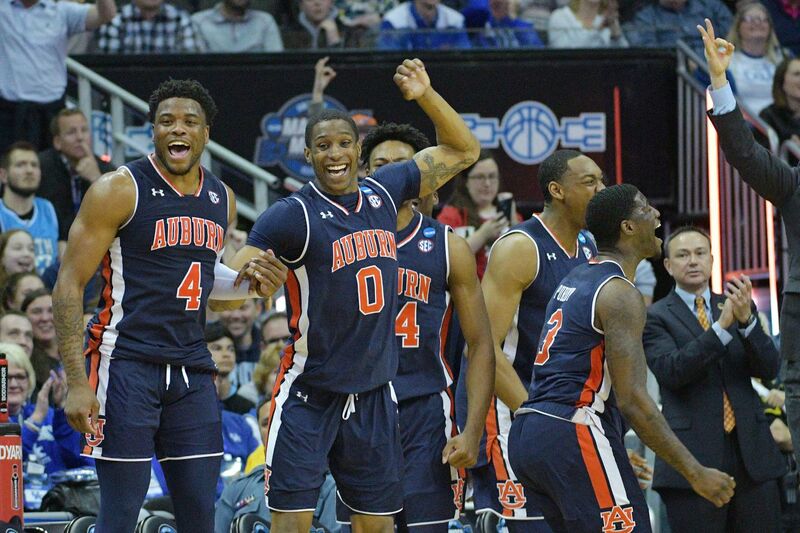 Can you imagine how sweet it would be for Auburn if they make their 1st Final Four after wins over Kansas, North Carolina and Kentucky? P.J. Washington (#25) returned to the lineup for Kentucky after missing the First 2 Rounds with a foot injury. He already had an advantage against a smaller Auburn group but the advantage is even bigger now without Chuma on the floor. Washington scored 16 points in 26 minutes in his return to the lineup Friday night against Houston. He came off the bench for Kentucky Friday night so we’ll see if Coach Calipari re-inserts him into the starting lineup for today’s game. He had 24 points and 6 rebounds in the game in Lexington and 13 points in the game held inside Auburn Arena. Holding Washington to around 15 points would be a monumental achievement for Auburn. Tyler Herro (#14) has a knack for making a big shot when Kentucky needs it. He did it again last night in the final minute. Herro led the Cats in scoring last night with 19 points including the above game-winning 3-pointer. He struggled in the 2nd Round against Wofford but when Kentucky needed a 3-pointer, Herro hit 1. That’s the kind of player Herro is. He’s a big time player capable of making big time plays. In his 2 games against Auburn this year, he scored 20 in Auburn and 17 in the game in Lexington. Keldon Johnson (#3) is the Cats 3rd leading scorer. He’s struggled a bit in the team’s last 2 games but scored 25 in Kentucky’s 1st round game against Abilene Christian. He had 20 points in the game in Auburn and 8 points and 17 rebounds in the team’s 2nd game. Reid Travis (#22) is back from injury and has played well in this tournament. His scoring was a bit down on Friday but he still managed 11 rebounds in the game. He’s averaging 10.3 rebounds a game in the NCAA Tournament. He had 17 points and 7 rebounds in the matchup with Auburn on January 19th. Travis will be extra motivated tomorrow as he looks to return to his hometown to play in the Final Four. Ashton Hagans (#2) didn’t play very well on Friday scoring just 4 points and turning the ball over 4 times against Houston. Hagans has averaged 10 points a game in the 2 meetings this season and had 7 rebounds and 6 assists in the team’s first meeting. It’s always a treat to see Hagans duel with Jared Harper at the Point Guard position and tomorrow will be no different. The biggest question obviously is, who will replace Chuma Okeke’s production. It’s essentially impossible to replace Okeke but Auburn is certainly going to try. Auburn got major contributions from players not named Jared Harper or Bryce Brown and will need to do that going forward. I think this game will go much better for Bryce Brown. Brown scored 28 points in the team’s first meeting in Auburn and almost single handily willed Auburn to a win that day. Brown scored just 12 points on Friday night, all in the 2nd half. He made just 2 3-pointers against the Tar Heels. But this will be the 2nd game in the Sprint Center for Auburn and if history repeats itself, put Bryce Brown down for a big game. Against Kansas, Bryce made 7 3s and scored 25 points in the win over the Jayhawks. I think it will take that kind of effort for Auburn to win today. Jared Harper had 9 points and 11 assists on Friday against the Tar Heels. He’s dealt with foul trouble a bit this tournament but to beat a team like Kentucky, he needs to stay on the floor. Auburn has been fortunate to have gotten great contributions from backup point guard J’Von McCormick in this tournament but Harper is the leader of this offense. Speaking of McCormick, Auburn’s not here without him. He was fantastic in the New Mexico State game and gave Auburn a big lift, especially in the 1st half with Harper on the bench with 2 fouls. While only averaging 4.1 points a game this year, he’s averaging close to 11 this tournament. It’s great for Auburn to have a safety valve if Harper struggles though. Danjel Purifoy has waited for his opportunity to shine and he got it on Friday night against UNC. He hit 3 consecutive 3-pointers and 4 for the game that put the game out of reach in the 2nd half. He’s used to playing 8-10 minutes a game but Auburn is going to need him to play a bunch more going forward. Speaking of guys who stepped up on Friday, Malik Dunbar was one of Auburn’s more consistent shooters, particularly in the 1st half. Dunbar ended up with 13 points for the game and was the team’s 2nd leading scorer Friday behind Okeke. Auburn needs some more #ClassicMalik to keep this run going. Auburn needs more from Horace Spencer, Anfernee McLemore and Austin Wiley as well. Horace hasn’t forgotten the cut he took in the 1st matchup and now would be the time for Spencer to get his revenge for that. McLemore played one of his better tournament games against Kansas and Auburn needs that type of performance. As for Wiley, any offense will be helpful from him. It’s the first time all year he’s been healthy enough to perform against Kentucky. While scoring just 1 point Friday night, I think he made the biggest play of the game. With the Tar Heels coming back, he blocked a sure dunk and soon after, Auburn’s lead would grow again. This is one of a handful of teams in this tournament that I wanted no part of, but here we are. This is the 1st time in NCAA Tournament history that a team has played Kansas, North Carolina and Kentucky in 3 consecutive games. These 3 schools are Top 3 all-time in wins in program history which makes this run even more sweeter. Kentucky embarrassed Auburn the last time these schools played on February 23rd, there’s no question about it. Auburn hasn’t lost since. With the way Auburn has played since that game though, anything is possible. I think Bryce Brown is going to score 25+ and one of Austin Wiley or Danjel Purifoy is going to step up big time in Okeke’s absence. Why Not Us? My gut says Auburn’s going to do this. They have to now, they have to #DoItForChuma.